JR Minkel, who blogs as only he can over at A Fistful of Science, recently brought to my attention this Paul Adams article for Popular Science (and indirectly, this news story in the Guardian) about the underappreciated importance of insects as a food source for many people around the world. That prompted me to dig out this recollection of my own foray into eating insects, which I wrote up years ago. My reputation in some circles as a person who eats bugs has been blown out of proportion. Yes, I have knowingly and voluntarily eaten insects, but I wish people wouldn’t pluck out that historical detail to epitomize me (“You remember, I’ve told you about John—he’s the bug-eater!”). It was so out of character for me. As a boy, I was fastidious to the point of annoying priggishness; other children would probably have enjoyed making me eat insects had the idea occurred to them, but I wouldn’t have chosen to do so myself. Bug eating was something I matured into, and performed as a professional duty, even a public service. Here’s how it happened. Back in 1992, the New York Entomological Society turned 100 years old, and decided to celebrate with a banquet at the map-and-hunting-trophy bedecked headquarters of the Explorers Club on East 70th Street. Yearning for attention, the Society’s leaders had the inspiration to put insects not only on the agenda but also on the menu. For hors d’oeuvres, you could try the mini fontina bruschetta with mealworm ganoush, or perhaps the wax worm fritters with plum sauce. Would you care for beetle bread with your potatoes, or are you saving room for the chocolate cricket torte? Waiter, could I get more mango dip for my water bug? Mind you, eating insects is not so bizarre and alien a concept in most of the world. 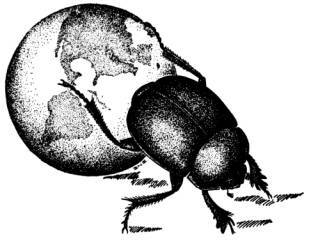 According to Gene DeFoliart, the editor of the Food Insects Newsletter (that’s right, they have a newsletter), societies outside of Europe and North America routinely eat at least some insects, sometimes because they are the closest things to livestock that’s available. Most of the world does not share our squeamishness about eating things with antennae. Moreover, the consequences of our cultural bigotry can be serious. The U.S. and Europe largely drive the budgets for food-related research around the world, which means that most spending on raising better food animals goes to studying cows, chickens and the like. Millions if not billions in Africa, Asia and Latin America however, would get much more direct benefit from knowing how to improve the fauna with six legs (or more) that provide much of their protein. Then, too, it’s not as though most of us in America haven’t ever eaten insects. Eight million of us live in New York alone, after all, and the Board of Health can’t be everywhere. The key difference is how many insects we’ve eaten, and how aware we were of it at the time. I had volunteered to cover this event for Scientific American, ostensibly because it would be a lighthearted addition to our pages. (“C’mon!” I had argued. “It’ll be fun! Lighten up! Don’t you get it, they’ll be eating bugs!”) For me, writing about entomology would be a pleasant change of pace because my beat at the magazine mostly ran toward molecular biology—the study of stuff that was once alive but has been dissected down into pieces so incredibly small no one can see or care about them. Beyond that, I also had a secret motivation for wanting to go. The truth is that I have always been somewhat afraid of insects. I love to look at them; I love to learn about them; their multilegged, exoskeletal ways fascinate me. But the notion of insects crawling on me, biting me, stinging me gives me the creeps. My hope was that if I went to this Entomology Society banquet and turned the tables on our arthropod pals, I would be free of this phobia forever. It was in this spirit that I arrived at the Explorer’s Club on May 20 to find that the entomology banquet had exploded into a full-blown, out-of-control media event. Approximately 80 people were attending the dinner as guests. Roughly another 250 were there as representatives of the press, doing a very good impression of a swarm of locusts, bumping into one another’s cameras, jostling the Explorer’s Club decorations, and stealing one another’s interviewees. They were doing everything, in fact, except eating. That behavior was unusual, because the standard arithmetic that applies to media events is Journalists + Free Food = No More Food. In this case, however, the members of the fourth estate were upholding the principle of being mere observers, not participants. Yet when the number of people reporting on an event so exceeds the number of people actually participating in it, it suddenly becomes much harder to find anyone to interview. In desperation, reporters on that night had started interviewing other reporters. Of course, the great advantage of interviewing another reporter instead of a real source is that the reporter will immediately give you the quotes you need rather than cluttering their statements with facts or trustworthy information. Since I was at the banquet as both a diner and a reporter, I was ideal. Thus, a reporter from the New York Daily News hit on me for colorful copy, and I was happy to oblige. “This is a night on which you do a lot of drinking,” I quipped, “and when you get home, you floss.” She happily wrote this down, and then spent much of the rest of the evening bringing other print and radio journalists to my side, to whom I said pretty much the same thing. But forget all that and ask the question that really matters: How do insects taste? Depending on how they’re prepared, they may not taste like much of anything. If the insects are ground up and used as an ingredient—as they were in the aforementioned mealworm ganoush and the cricket torte—they can be completely unnoticeable. (That’s probably not the most reassuring thing you could hear if you ordinarily worry about insects in your food.) When the insects were served whole, they had a bit more distinctiveness to offer, although not necessarily something too strange. The first offerings of the night, for example, were small wicker baskets filled with assorted fried crickets and grubs. These tasted primarily of salt and oil, with a slightly nutty aftertaste, not unlike most of the snacks you’d find sitting in a bar. (I’ll grant you this assessment may reflect less on the insects than on the quality of the bars I frequent.) The fried insects were all too recognizable for what they were, but taken individually, they were not too off-putting. Baskets full of them, however, were much more disturbing: every time anyone removed a handful, the rest would shift position in a way that created the illusion the buggy pile was still alive and squirming. One type of insect being served was in fact still alive: honeypot ants from the Southwest. The pea-sized abdomens of these ants were engorged with peach nectar. In the wild, these swollen workers act as living canteens for their colonies. Pop one in your mouth and bite down fast, and you might not notice that this gumdrop is still wriggling, though you might notice the extra lemony zest of formic acid it spat at you in its last moment. I had less than favorable reviews for only two dishes from that evening, and I don’t think it’s a coincidence that they were the ones involving the largest insects. The first was listed as a roasted Australian kurrajong grub. Kurrajong is actually another name for the Brachychiton genus of trees and shrubs that can play host to many types of wood-borers; I think the insect in question is what is more commonly called a witchetty (or witjuti) grub, an old staple of the Aboriginal people. Here we have something that looks not unlike a pale link sausage, but with a head like a chive. In flavor, too, the witchetty grub is reminiscent of sausage, though one in which the meat has been stretched with too much mealy filler and the casing has perhaps a bit too much snap. Not to my personal taste, but not inherently awful. However. That brings us to my Waterloo, the sautéed Thai water bug. This dish was every nightmare I might ever have had about an insect banquet rolled into one. For openers, it is a water bug, which is to say, it looks like a gigantic cockroach. Whatever it was sautéed in did nothing to disguise its fundamentally roachy nature. It was an insect, whole and uninviting, sitting on a plate, looking like it wanted to run away as much as I did. Furthermore, because this water bug was about three inches long, it posed a problem that none of the other edible insects that night did: I would have to eat it in at least two bites. Which end to eat first? The front half looked spiky and crusty; the back half looked like it held reservoirs of goo. —when I suddenly became aware of a halo of bright lights surrounding me. It was my fellow jackals of the press, circling, smelling my vulnerability. The camera crews had been hoping to catch somebody eating one of these six-legged abominations for the first time, and there sat I: so obliging, so quotable. Feeling unable to back out of the situation, I raised the beetle to my lips (noticing that, dear god, it had a noticeable heft), oriented its head and thorax down my throat and bit down. It managed to be even less appealing than I’d expected. As my teeth crunched through the brittle exoskeleton, the rapidly disarticulating body parts poked my tongue and palate. Oh my god, I thought, I’ve got a leg stuck between my teeth. Worse, the flavor was grotesque: acrid and somehow reminiscent of lighter fluid. The bug’s feel in my mouth made me think of globs of barbecue sauce that had fallen onto a grill and burned. “How do you like it?” asked one of the reporters from the enviably insect-free crowd. Resisting the temptation to spit the mouthful back onto the plate, I managed to mumble, “Mmm, that’s some bug”—not a memorable bon mot, but if Oscar Wilde ever ate insects while in prison, no epigrams marked that occasion either. At that moment I knew with crystalline certainty that my phobia about insects was not going away after that evening, that it might never be going away—and that if anything, my neurosis had picked up extra material to work with. And no, the second bite was not any better. The kitchen staff swirled around her, carrying containers with masking-tape labels such as "cream cheese mealworm dip" and "bug grub." Behind the stove, a cockroach scurried up the wall. " Yike's," said Elliot, taking a swat at it with a rag. "That's not one of ours."